During my holiday in Italy, I’ve missed the delivery of the new 39mm Rolex Explorer hitting the local authorized dealers. I’ve kept my eyes open in Italy (see this link), but aside from the new Tudor Heritage Chrono, there wasn’t much ‘new’ to see in the displays. The new Submariner in black and green were already available before my holiday, and the green model surprised me in a positive manner I have to admit. Anyway, when I got back last weekend, I immediately noticed the availability of the new Rolex Explorer ref. 214270 on some of my sponsor websites. 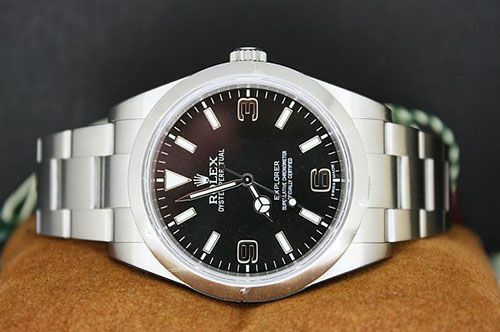 There was also this private seller on the Dutch Rolex Forum offering a BNIB Rolex Explorer 39mm for just above 4K euro. The picture above is a BNIB Explorer for sale at Precisionwatches, a great and reliable on-line dealer in The Netherlands. His price is 4400 euro, this is under list price (4550 euro). This new model has – aside the size – a few differences compared to the original and to be discontinued Rolex Explorer 114270. Its movement is of a newer type, caliber 3132. It features a Parachrom hairspring with Breguet overcoil Paraflex shock absorbers. However, I don’t think most Rolex owners will (or do) care about the mechanics inside. I love this watch, my wife has the original model (114270) and it looks great on her. The fact that this new model is 39mm, would make it suitable for me as well, but I wonder how fast I would be annoyed with the hands of this model. Rolex appearantly used the hands of the 36mm model, which are too short for this new version in my opinion.